WHITELAND, Ind. -- A frustrated Whiteland driver has been doing battle for two-months over a toll he said he’s not responsible for. In March, Mike David drove to Nashville, Tennessee with his family. They took I-65, crossing the toll bridge into Louisville, Kentucky. 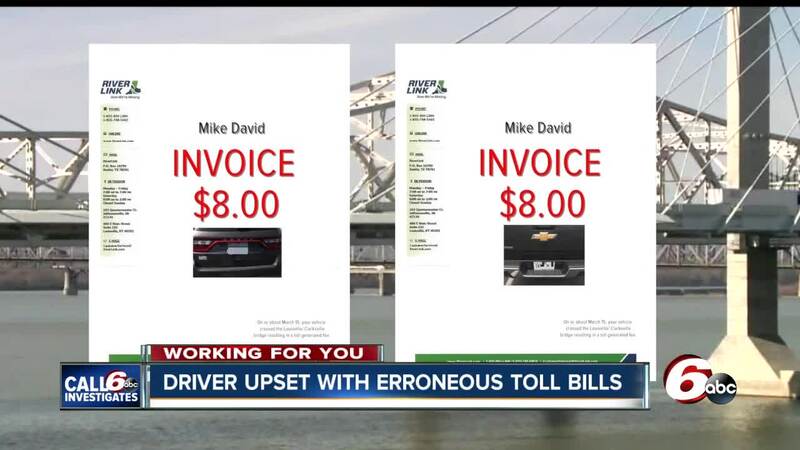 Mike expected to get an $8 invoice in the mail from RiverLink, the company in charge of tolling. Instead, in early April he received two invoices—one for his car and another for a mystery car. Mike thought that would take care of the problem, but it didn’t. “I then got a letter from them saying we've investigated your claim and we need more information, we do still believe it's your car," said Mike. Mike went to the Franklin BMV and they told him to go to MyBMV.com and print out a list of cars registered in his name and send it to RiverLink. He had paid the toll invoice for the car he was driving. “I have no idea how they thought I had two cars going across the bridge pretty much at the same time,” said Mike. “It's frustrating because they came back and said we want more, but i don't know what more i can give them!" Mike said he called RiverLink and selected the option to have an agent call him. “I never heard back from them,” said Mike. Then, Mike thought to contact Call 6 Investigates. “I’ve seen your segments before, so I figured I’d put a shot in the dark and see what happens and fortunately you got back with me,” said Mike. Call 6 Investigates found 147 consumer complaints have been filed with the Indiana Attorney General’s office since February 2017, mostly for billing disputes, mistaken identity, overcharging, unsatisfactory performance, and unreasonable fees. Call 6 reached out to RiverLink on Tuesday about Mike David’s erroneous charge, and on Friday the company responded saying they’re working to remove the toll from Mike’s record. “The process should be much simpler for anyone who receives an invoice for a vehicle that does not belong to them, but it is important to resolve to prevent repeat invoices and growing frustration,” said RiverLink spokeswoman Mindy Peterson. Mike David decided to turn the tables a bit and sent RiverLink an invoice for $91 for his time and mileage. “I threw in a few charges as kind of a shot against them, because I thought I was having to go to this extreme where we didn’t do anything wrong and it wasn’t our fault,” said Mike. Mike isn’t expecting to get any of that money, but he’s glad RiverLink will take the toll off his record. "I do appreciate you looking into it for me," said Mike David. Call 6 Investigates also checked with the Indiana Department of Transportation which has a contract with RiverLink and provides oversight through daily operations and a joint tolling body. Manning said Riverlink generally coordinates between the customer and BMV to investigate vehicle ownership. “Once confirmation is received that the vehicle is sold or otherwise no longer owned by the customer toll charges are removed from the customer’s account,” said Manning. Call 6 Investigates has received consumer complaints about not receiving invoices, fear of having their registration frozen , and poor customer service. A spokesperson for RiverLink said the company has developed a “get well” plan to improve the overall customer experience, including adding 80 additional representatives, additional training classes and a “pay-by-plate” option for consumers. Riverlink’s system all-electronic tolling which requires no toll booths, according to their website, and is set up on the new new Abraham Lincoln Bridge in downtown Louisville (I-65), the Kennedy Bridge in downtown Louisville (also I-65), the new Lewis and Clark Bridge connecting the extension of the Snyder Freeway (I-265) with Southern Indiana. Peterson said their system is most efficient and cost-effective when customers have transponders and prepaid accounts. As for the complaints filed with the Indiana Attorney General’s office, records show RiverLink has worked to resolve many of those and has provided refunds in some cases.